The Short Version: Senior-Dating.org is a comprehensive dating resource and blog for singles in their golden years. When returning to the dating scene after being divorced or widowed, mature daters may find online dating to be a challenge, and that’s why Kathy Damer started a blog to assist people in search of companionship or love. On Senior-Dating.org, she writes thoughtful responses to questions emailed to her about senior romance and dating websites. Kathy’s empathetic and expert guidance helps readers better understand online dating in the 21st century. In her late 50s, Jane married a man she loved deeply, thinking they would spend the rest of their lives side by side, content in each other’s company. However, within only two years, he had the first of a series of strokes that would slowly take away everything that made him the man she loved. Jane stood by him for seven years and watched, helpless, as his health deteriorated. After the fifth stroke, when he no longer recognized his own wife, he was placed in a nursing facility because she could no longer care for him by herself. Now alone in their home, Jane found solace with a widower she met online. They talked every evening about the pain of losing someone dear to them, and while their conversation comforted her, she felt conflicted about an in-person relationship — after all, she was still a married woman. She was at a crossroads with no idea what the right thing to do would be, so she wrote in to Senior-Dating.org for help. While working in a retirement community, Kathy Damer saw the issues facing senior daters. “You still have needs that are important to you,” Kathy Damer, the site’s Founder, wrote back. “You are still full of life, and you are entitled to happiness.” She encouraged Jane to follow her heart and think about what her husband would want for her. On her blog, Kathy advises many seniors, like Jane, who write in with unique concerns and challenges — particularly in regards to online dating. Senior-Dating.org offers emotional support and expert advice to anyone seeking companionship or romance online. Kathy, who writes for and runs the site herself, doesn’t focus on just one aspect of senior dating, but covers everything from how to spot scammers to how to tell your adult children you’re ready to date again. Kathy is an unabashed “people person” — she loves talking with others and creating strong bonds with them. She got her degree in sociology because she’s interested in people and how they interact. 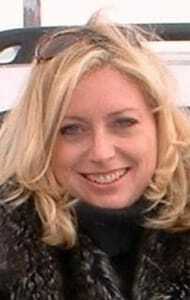 In 2002, she became a marketing executive in the retirement and senior care industry, working five to six days a week to get to know the people better. “Much to my delight, I developed these incredible bonds with many of the residents who lived in the community,” she said. Kathy made fast friends and soon had visitors coming to her every day for advice about their relationship or family issues. To her surprise, she found a lot of romance and drama can go on in retirement communities, and she felt seniors needed some assistance with dating, especially with the rise of online dating. 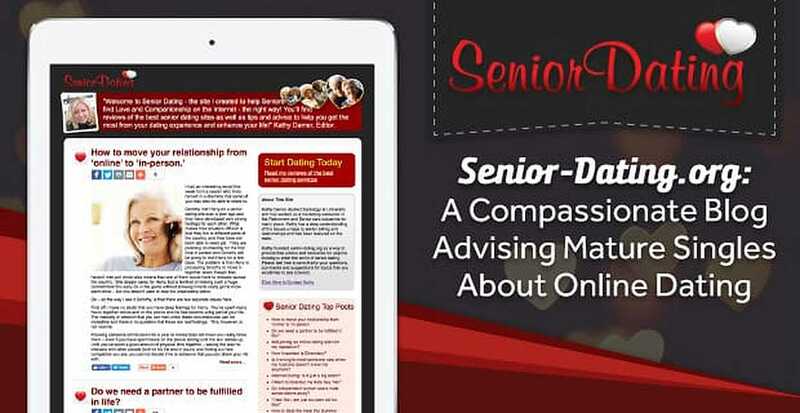 Senior-Dating.org is a trusted dating resource for seniors with questions about online dating. Based on her firsthand experience working with seniors, she decided to build her own website, Senior-Dating.org, to be a hub of insightful do’s and don’ts for mature people dating in the modern age. People from all over the world visit Senior-Dating.org in search of guidance. A majority of the audience tends to range from their late 50s to early 80s, but Kathy said there are some adult children who want to help their senior parent(s) date. Kathy lets her readership influence and direct the topics of her posts. She writes articles as responses to the questions and concerns she finds in her inbox. She encourages her readers to shoot her an email, using the Senior-Dating.org contact form, any time. The positive responses Kathy receives every day inspires her to keep writing articles and expanding the site. Kathy meets a demand among older generations for good, grounded advice about online dating. Senior-Dating.org provides safety tips for arranging a first meeting as well as senior dating conversational no-nos to make online dating less intimidating. For years, she’s been the sole contributor running the site on sheer passion and know-how (with the occasional tech support from her husband). In well-reasoned articles, she talks directly to her readers as though she were advising a friend. She takes an interest in the well-being and happiness of her readership, and that consideration shines through in her writing. “I will often ask them to keep in touch because I genuinely want their situation to improve,” Kathy said. She doesn’t publish all her correspondence with seniors, maintaining a certain level of discretion, but she always answers anyone who comes to her for help. For mature singles, dating can be complicated. Sometimes there are adult children involved or privacy concerns — or sometimes a health-related issue might be holding someone back from having a truly fulfilling relationship. 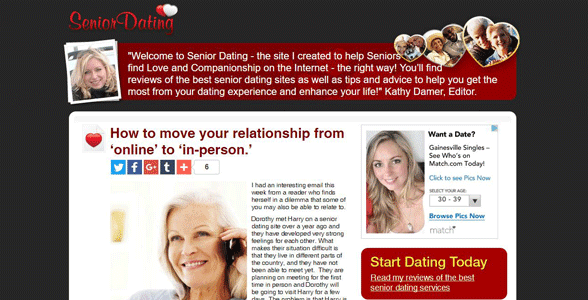 Kathy set out to simplify that great unknown with Senior-Dating.org, and the feedback has been largely positive. Thanks to Kathy’s blog, senior daters can learn more about online dating so they’re ready to log in and start flirting. On the site, singles find steadfast encouragement to guide them through every step of the romance. Whether you’re hesitant to plunge back into love because of a difficult situation (like Jane’s) or you’re worried about encountering scammers online, Senior-Dating.org can help.